Our goal is to provide the highest musical and video performance to your environment. We understand that you will have this system in your favorite room for many years. That is why we believe your electronics should be able to grace your home with style and finish, or if you wish, by being essentially invisible. Most of our speaker lines and cabinets are available in many finishes and sizes. We have found lines that don't sacrifice performance while pursuing great looks. However, if you have a unique situation or space, our custom speakers can be made to order. Happily, they will not compromise your quest for great sound at all. Anytime you have a project that seems challenging, ask us for some free advice. It's likely that we'll have the most cost-effective solution to offer you. Why do discerning music and movie aficionados choose Paul Squillo Music Systems over much larger AV specialists? I design, sell, install, calibrate and service high quality home entertainment systems for Southern California. I’m a Chicago boy at heart, so don’t expect me to use the all-too-frequent alpha-dog intimidation to establish my value and expertise with you. I’m here to show you how to get more from your system than most people know to ask for, and that takes time and some re-educating. You deserve to know what I’m doing for you, but I promise that I’ll make the process fun. I have over 40 years of high-performance audio and video experience, over 15 years in Southern California. My specialty is creating exceptional-sounding music systems with stunning video, and I strive for this at every price range. I love music and have been a musician all my life, so musical accuracy and emotional content come first! My budget systems routinely sound and look better than others’ more expensive packages, and my high-end audio systems will out-perform what others dare to call “state-of-the-art”. I represent some of the world’s finest audiophile separates, exceptional home theater electronics, and audiophile accessories from great names like NuForce, McCormack, Yamaha, Marantz and Denon. I also represent some of the best-sounding speakers in the world, from world-class companies like Martin Logan, Monitor Audio, Gershman Acoustics, RBH, and my own line of custom speakers, AtmaTec. I constantly strive for the latest ways to make your system sound ever truer to the original performance. Over the decades I’ve been known to fly in the face of convention; big companies want to push the status quo. Need proof? Virtually all of the high-end companies ignore that just a moment after your ears hear a pure stereo signal from your speakers, the sound intended for your left ear reaches the right ear, and the sound intended for your right ear reaches the left ear. Talk about horrible crosstalk and time errors! Your brain does not know how to interpret this, so the sound you hear is severely compromised. There are solutions for this that really work. Why not hear what the mics really picked up? This is just one place where my quest for an ever-deeper understanding of audio and music can give you a huge increase in performance from even a modest system. Thinking green lately? I can make many styles of my AtmaTec speakers with over 100dB sensitivity, so they use less than one-tenth the power of most speakers. I also carry new audiophile-quality digital amplifiers that can be up to 90% efficient; that means they are 3 times as efficient as a typical amplifier. That’s good for both the planet AND your wallet! I promote the use of safe materials, and offer an aggressive approach to taking your old equipment in trade, so your old equipment can ultimately serve a new owner, which is much better for the environment than just recycling it. I do both home and commercial projects. These include whole-house, multi-room and outdoor music and home theater systems, office and restaurant background music systems, desk-top audio systems, boardrooms and bars, pro sound, sound reinforcement systems, PA equipment and recording studios. The most important consideration of your new system is performance. I’ve got great ears and lots of experience designing systems that sound way better than they should for their price. I’ll be happy to introduce you to past clients that have come to rely on me for decades, to help them find a system that’s perfect for their tastes, their rooms, and their budgets, big or small. The most rapidly growing product category in audio today is the personal electronics. I have great headphones, players, amps, and even processors that finally move the sound out from between your ears where it belongs. I also carry great video! We’re in another transition period for fine video. The new Ultra High Definition TV’s with 4K resolution don’t all have the ability to play 4K material yet, so I’ll be happy to help you plan out the video part of your system to look amazing now, and be future-proof later. I make everything easy for you. I design universal remote control solutions from URC and RTI to make controlling your system a breeze. So what are you waiting for? Trade me some of your old gear today for a “Dream System Certificate”, or pick up an inexpensive audiophile accessory that makes your system sing like never before. You deserve great music in your life! 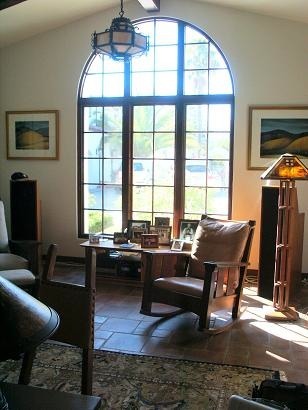 These custom AtmaTec towers were designed and finished to complement JS's vintage McIntosh tube electronics and his Stickley mission-style furnishings in his impressive home office in beautiful Ojai.